The recent rally in the US$ was more a product of the fall in other currencies than a strengthening of the dollar. In particular we have seen the British Pound fall dramatically in the first two months of this year and this was followed by the Japanese Yen which tumbled recently on the inflationary actions introduced by the Bank of Japan. The value of a position in the precious metals sector would have increased for those living in the UK or Japan, but for investors living in the United States the strength of the dollar has eroded the value of their holdings in the gold and silver space. The above chart shows the rally commencing in February at the ‘79’ level and progressing up to the ‘83’ level where it falters and pulls back slightly. This maybe just a breather before resuming its trek north or it could retrace its steps all the way back to the ‘79’ level. Should it fall through ‘79’ then ‘74’ and ‘72’ could be tested in short order. We would also draw your attention to that it was unable to form a higher high which suggests further weakness lies ahead. Gold prices have faded badly since the October high of $1800.00/oz despite continual money printing by various sovereign states. The recent jobs numbers out of the US were very poor indeed, but gold didn’t react with the gusto that we would have expected. Also note that the stress and upheaval emanating from the Cypriot banking system hardly moved gold. 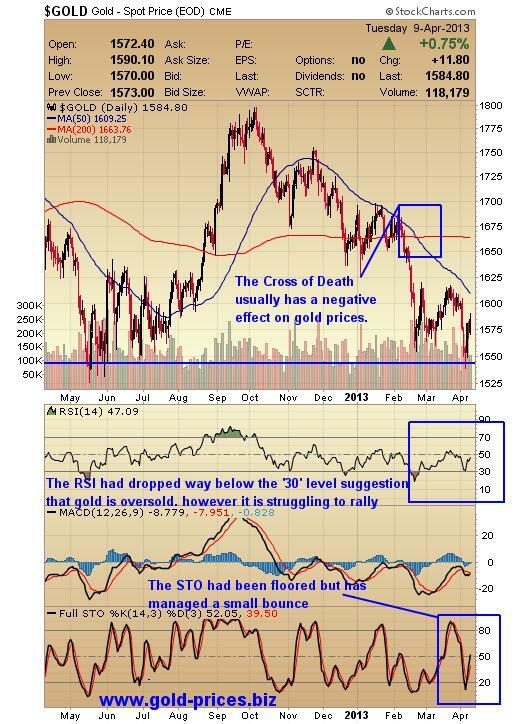 On the downside the $1550.00/oz level appears to be an area of support for gold prices, however, should that fail then many will be disheartened and tempted to capitulate. On the upside gold prices needs to break up through the 50dma at $1609.00 and then through the 200dma at $1663. This doesn’t sound like a lot to do but it would go a fair way in restoring investor confidence. Another stumbling block is the summer season which is now upon us and gold and silver prices tend to drift from here to Labor Day with very little in the way of action in either direction. The fiasco surrounding the Cypriot banking system hardly moved gold but it has put the spot light on the possibility of the implementation of similar ‘Bail In’ strategies as a solution, should other banks find themselves in difficulty. This is a Eurozone problem and it remains to be seen if the flight to safety will be to the precious metals sector or to alternative currencies, such as the US dollar. It’s a difficult call, shaky banks, money printing, government spending and borrowing at record levels, gold and silver out of favor and the summer doldrums. If we then add to the mix political unrest from Korea to Italy, the Arab Spring, unrest in Africa, the outlook is none too bright. As we see it the dollar could well have the upper hand in the short term, but it is a fiat currency and as such is destined to head south. 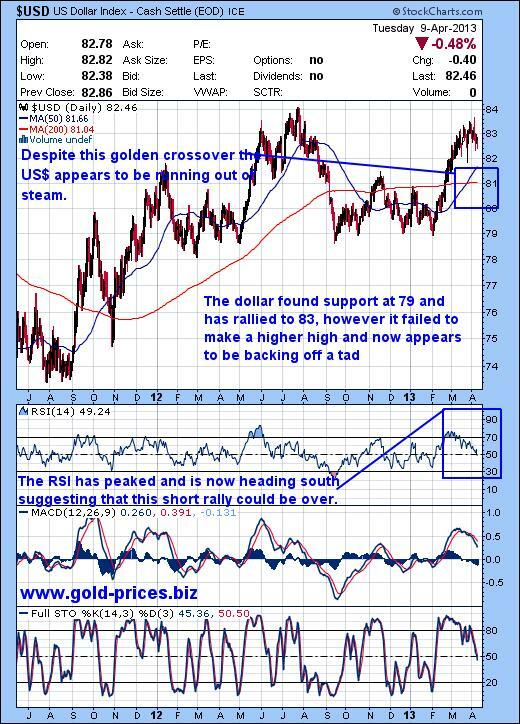 Sooner or later gold and silver will be recognized as real money and become the investor’s safe haven of choice in this tumultuous environment.